The long green hangar doors are part rolled back. Parading in the gap, the giant, robot-like landing gear of the Airbus A340-600 plays with your sense of scale. In just over a century since this hangar 16S was built in 1917 aircraft have supersized. It originally housed newly finished aircraft as an ‘acceptance’ hangar, has been a base for mending light aircraft and was most recently used by the air ambulance. 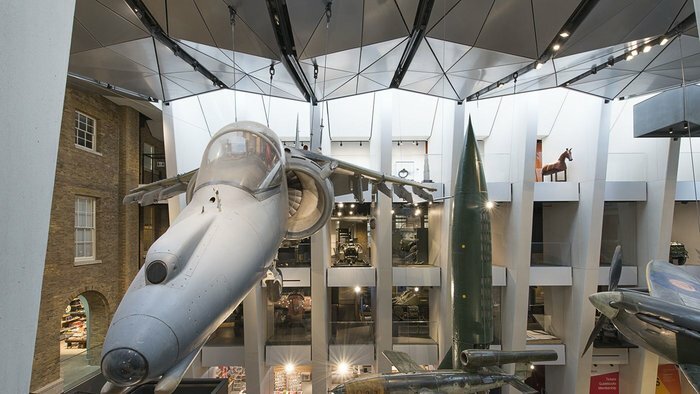 Now, as Bristol Aerospace Museum, it houses a Sea Harrier – or Harrier jump jet as I knew it as a child – and buses, trams, missiles, a Bristol Type 173 double rotor helicopter and the innards of many other flying machines. Over the years, Filton airfield just outside Bristol was the testing ground for many of these vehicles as well as, more famously, for Concorde. When BAE sold it off for development two hangars went to the enthusiasts who over the years had been collecting planes and their parts for Bristol Aero Collection Trust. With money from the Heritage Lottery Fund Purcell has transformed the first of these. RIBAJ Rising Star Úna Breathnach-Hifeárnain was project architect for the £16 million conversion of this building and the new gallery next door – devoted to the last Concorde to fly. She has come to love the historic Belfast trusses as much as the delicate exhibits that have been wheeled in under them. In fact the three bays of timber Belfast trusses make up the only intact timber triple bay in the country. The 24m deep structure, reaching out over a total 73m, was designed just as wide spans were switching from timber to steel. Each truss comes to rest on brick piers which split the bays as they run the width of the building in pairs. These trusses bring a unifying materiality to the diverse collection. As you weave between exhibits the parallel structures impose an order from above, their latticework a reminder of the timber planes of early aeronautical pioneers – who may have had a hand in the hangar design too. The bays are used to organised the plan. The second and third are given over to the exhibition while the first carries the rest of the load of ancillary but essential spaces – reception, shop, café, education rooms. Nevertheless, from the entrance to one side, glimpses into the exhibition are visible from the ­ticket desk. The workshop-classrooms are kept enclosed, warm and quiet with an interestingly timber clad box (on the angles, you see the influence of the contractors’ foreman, a joiner by trade, who worked closely with Breathnach-Hifeárnain on the setting out). Each education room has its own character. A galvanised ‘balcony’ makes one just right for testing the aerodynamics of paper planes. ­Another is up in the roof, close to the trusses, and this one also looks out over the café towards the promise of the Concorde shed. The café itself is a double-height space with south-facing gaps in the hangar doors shaded by appropriately industrial looking galvanised mesh from Elefant Gratings. New high-level windows and original Crittall windows (blacked out in the other bays for the ­exhibition) keep this bay as light as possible. Before the museum took over there were walls up to 2.7m between many of brick piers. Purcell tried to do away with these but the exhibition designers at Event wanted some walls for display and light control. 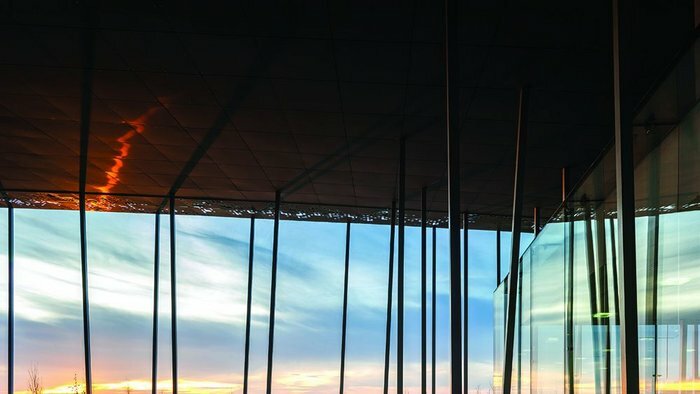 So they have been reinstated between the entrance bay and the exhibition, except where a 2.9m wide pane of glass forms an entrance to the exhibition by sliding out of sight when the museum is open. The brick piers themselves took some cleaning up; in the initial enabling contract the brick was partially cleaned to remove lead paint. The enabling contract was also an opportunity to remove the sinusoidal tin roof with its asbestos layer. It has now been replaced with a sandwich of crinkly tin inside with insulation and a steel roof on top. A new floor was also needed – mainly to bring power for individual exhibits and displays, something that would have been messy to deliver from above, alongside the trusses. Adding cables and a new layer of concrete to a concrete floor sounds simple, but it was not straightforward. Surveys showed a 250mm drop between the floor level of the first and third bays. So an average extra 150mm depth of concrete ranged between 80 and 200mm – 80mm being the minimum required for extra strong steel floor boxes. Spreader plates are still needed when a heavy exhibit, like the Harrier or a Bloodhound Missile, is wheeled in. A big question was how to get delicate planes into place. To cross the threshold they need to ascend 150mm and there was concern that some timber-framed aircraft would come apart with the slightest flex. Despite efforts by expert members of the trust with Breathnach-Hifeárnain and contractors Kier to devise a ramp, the most delicate exhibits were eventually craned into place. Planes and other vehicles were brought in early and kept encased in plastic while work went on around them. This meant they could be brought through the hangar doors, which hang off a gantry connected to the roof and allow the hangar to be fully opened up. The hanger doors have now been given an extra secure and insulated layer. But there are still removable panels to allow reconfiguration in the next few years – including replacing a replica of the Bristol Fighter with a restored original. Looking at the ceiling the discipline of the servicing is particularly noticeable. Breathnach-Hifeárnain wasn’t hoping for much when Kier started on the building. Behind the panels of the Concorde gallery the servicing was all over the place. But when it came to being on show the pipework is supremely neat, its lines of silver like army columns, marching in order over the terrain of trusses. Ductwork is camouflaged with grey fabric ducts working with grey radiant panels, all leaning towards the industrial but without the shiny machine visibility of the pipes. While the new Concorde gallery appears a high definition, technical space – rather like its main exhibit – the 16S hanger has a character and complexity that is very different. Both its building and its exhibits speak of a different time; of human scale, invention and rapid change. The electronics and robotics of future flying will also be on show, but it is hard to ­believe that the huge grey hangers of the modern aerospace industry that cluster around Filton will create either objects or architecture that are quite so engaging. Each dark stained Belfast truss spans 24m and is made up of many pieces of laminated softwood, across the span and on the timber lattice above. The Belfast trusses have survived remarkably well – the most damage being where they meet the piers and water from the roof has got in. Softwood repairs have been spliced in, left unstained to make the refurbishment quite clear. The steel panel doors were not secure enough for the collection which includes some priceless pieces. Nor did they help maintain a reasonable temperature. So they have been reconfigured as walls with 125mm insulated panels behind them on the new floor plinth. Panels are removable, allowing planes to be wheeled in and out.